The Indiana eviction notice forms are used to commence evictions proceedings in the State of Indiana. If a tenant has failed to pay rent when it is due under the terms of the lease, the landlord must provide written notice to the tenant that they have ten days to pay rent or vacate the premises (Use the 10-Day Notice to Quit (Non-Payment of Rent)). If the tenant both fails to pay the rent within the ten days and fails to move out, the landlord may file a Complaint for Eviction with the Local Trial Court. 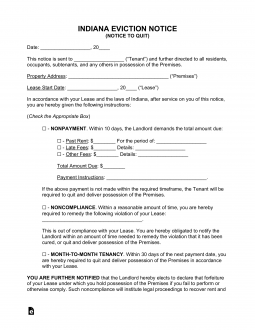 10-Day Notice to Quit (Non-Payment of Rent) – This form is used when the tenant is behind in his or her rental payments. Once the tenant has received this notice, he or she has ten days to pay the rent or vacate the property. 30-Day Notice (Month to Month) – This form is used when a landlord seeks to end a month-to-month tenancy. Rent is late when a tenant has failed to pay it when it is due under the terms of the lease. Tenant has ten days to pay the full amount of the rent upon receiving written notice from landlord to pay or vacate. If the tenant is committing waste (destroying the property), the landlord does not need to provide notice in order to commence the eviction process. Step 2 – If the tenant fails to respond to the notice and remains at the premises, landlord can file an action in the Local Court to evict the tenant starting with the Complaint Form. Step 3 – The landlord must have the complaint and summons served on the tenant and the tenant will have to show up in court on the date specified by the clerk. If the tenant does not respond, the court will issue an order granting possession to the landlord. You should take a moment to review the Lease Agreement being focused upon in this document. This form will require that any information referred to in the Lease be reported accurately. In addition to a Signed Lease, you will also need to download the Indiana Notice to Quit, which may be obtained through the PDF, ODT, or Word buttons on this page. Several facts will need to introduce this document. The first will be the Identity of the Recipient. Enter this person’s Name on the first line of this page. Next, you will need to verify the Rental Property being discussed. This will be done using the blank spaces in the first statement (starting with the phrase “The premises herein…”). Input the following information in this order: Rental Property’s City, Rental Property’s County, Rental Property’s Zip Code, Rental Property’s Building Number and Street, and (if relevant) the Rental Property’s Apartment Number. Finally, the Date the Lease Agreement was Signed must be documented. This should be done in the second statement (starting with the phrase “In accordance with…”) utilizing the three blank spaces available. The first space will require the Calendar Day, the second space will require the Month, and the third space will require the Year of the Lease’s Signature Date. Nonpayment: This statement is addressed to Tenant(s) from the Landlord. Here, the Landlord issues a choice to a Tenant who has an outstanding debt due to nonpayment of rent. The Tenant will have ten days to either relinquish the premises to the Landlord or pay the required amount to the Landlord or an alternate Agent. The alternate Agent will need to be defined on the first blank space. The second and third blank spaces will require the Dollar Amount owed by the Tenant. The fourth will require the Dollar Amount that must be paid. The blank spaces after the words “Due from” will require a definition to the Rental Period that must be paid. Noncompliance: This statement is addressed to the Tenant(s) from the Landlord. Here, the Tenant is expressly informed that he or she has breached the terms of the Lease. These breached items must be reported on the blank space in this statement. This statement informs the Tenant that he or she must comply with the Lease or immediately relinquish possession of this property. Month to Month Tenancy: This statement is from the Landlord to the Tenant. Here, the Landlord will Name a Date that must be at least thirty days from the Rent Due Date. This Date will be the expected Termination Date of the current Month to Month Agreement these two parties share. Month to Month Tenancy: This statement is from the Tenant to the Landlord. It will Name a date where the Month to Month Tenancy will expire. This Date must allow for at least thirty days to pass from the next Payment Date. The delivery of this document will be reported by the individual physically delivering this Notice to the Recipient. The Agent will document the Delivery Date and the individual to whom it was delivered in the statement starting with “I certify that on…” Additionally, the first, second, or third checkbox to indicate if the notice was delivered directly to the intended recipient, a reliable party a part of the recipient’s household or place of employment, or by First Class Mail. The “Certificate of Service” section must be signed by this Agent.